Listen to the podcast. Download the podcast. Find it on iTunes/iPod. Learn more. Charter sponsor: Active Endpoints. Welcome to the latest BriefingsDirect Insights Edition, Vol. 31, a periodic discussion and dissection of software, services, SOA and compute cloud-related news and events, with a panel of IT analysts and guests. 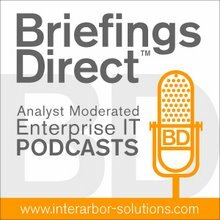 In this episode, recorded Oct. 10, 2008, our experts examine the worldwide economic maelstrom, with an eye to the IT sector and how enterprises and vendors will be impacted. While the times will remain challenging for the foreseeable future, there are opportunities and counter-intuitive effects -- like beginning a start-up company -- when economics drive more of the rationalization around IT decisions. Please join noted IT industry analysts and experts Tony Baer, senior analyst at Ovum; Jim Kobielus, senior analyst at Forrester Research, and Dave Linthicum, independent SOA consultant at Linthicum Group. Our discussion is hosted and moderated by your's truly. Baer: ... The winners are those who are likely to be more diversified into services, services that can help companies harvest more of what they already have. ... The fact is that in an economic situation like this, especially where there are a lot of known unknowns, having a services business is a good way of helping clients to discover new economies. And it's also potentially a much more flexible arrangement than having to put in an upgrade of a new version of SAP software. Gardner: My first take on this is that the government vertical is actually going to explode and might even start going down this road towards transformation in a much more significant way. Linthicum: People are going to look to government to solve some of these issues and bureaucratic changes are going to be built here in different divisions, and people are going to have oversight of the financial industry. If the Democratic administration comes in, there is going to be more civilian spending, and there is going to be probably a little shift from the spending in the Department of Defense on the military side. So, this area is going to be explosive yet again, based on some things that are occurring and based on the government taking power in particular industries. ... I think healthcare is going to remain fairly static, and I think some of their costs maybe reduced. As they start moving into more of a socialized medicine, if the Democrats take it there, there is going to be some big shifts there. Believe it or not, even though you are moving into a healthcare-for-everyone kind of an environment, you are going to see that actually [IT] cost probably will go up, as a bureaucracy is put in place to maintain and administer that. Baer: I hate to use the 'D' word but back in the depression, and I hope we are not heading into one, what area boomed during that era? Hollywood, the film industry. People were going out to the movies for cheap thrills. In today's environment, the equivalent of that is, if you already have an Xbox 360 out there, you are going to be buying more games. Those are cheap thrills. Gardner: We haven't talked about one sector, and that is the Entertainment/Web 2.0/Internet. We’ve seen some downturn in advertising, including Internet advertising, but is there an opportunity for buying $3 movie and downloading it, a $2 song, a $3 game. Koblielus: ... Those who will get hurt are those vendors who rely on new-product sales, especially new product sales that are very much hardware-centric. ... In any economic downturn, the things that get cut from corporate budgets, for example, are large capital expenditure (CAPEX) projects. That's going to hurt a number of IT vendors in particular niches, for example the hardware vendors, and also where it's a discretionary software upgrade purchase. Those are also going to feel the crunch. In any downturn, users, large corporate IT, look to rationalize and streamline their vendor commitments. In other words, they consolidate to a few very large, very strategic vendors. So, the big guys will get bigger and the small, pure-play data-warehousing appliance vendors will be acquired or will vanish. Gardner: On the other hand some, verticals that don't look good include retail and manufacturing. The auto industry is getting whacked. Linthicum: The retail space is going to suffer tremendously. They already have very narrow razor-thin margins. I think we are going to see a lot of the larger retailers suffer and perhaps go away. ... Finance is obviously going to be killed for a long time, especially the banking industry. That's going to be an area that isn't going to recover very quickly from what's going on right now, but I think that manufacturing ultimately will recover and we are going to see some good growth in the year 2009-2010. Kobielus: ... It basically supplements the fact that there is going to be a decline in the journalist population, essentially a migration towards the extremes, which is on one hand journalism and this is not a development. I’m very happy to see is that, as the financial base and the business model for journalism businesses is evaporating at this point, you are seeing more-and-more citizen journalists taking up more of the load. People are reading more blogs. They are not buying newspapers. Linthicum: [IT buyers] are looking to morph the way in which they consume IT. ... They plan to implement strategic technology into their enterprise [in a way that] increases in interest but decreases in cost. In other words, people are going to move into more efficient technologies. They are going to look at a little bit more at cloud computing and other ways to save money and start moving aggressively in those directions. ... Instead of having a huge Microsoft infrastructure just for e-mail and calendar-sharing in groupware, and those sorts of things, moving to things that are in the cloud. This is obviously Google, but there is also a ton of other guys that are offering some pretty good technology -- information-sharing using similar infrastructure. They’ll start outsourcing that, versus maintaining all these data centers that are just dealing with e-mail and communication between people within the company. Gardner: Where does this put Microsoft? Bear: ... They are in a transition. ... In the short-term, I think it's going to hurt their business, because clearly take-up of Vista has pretty well-flagged, especially on the corporate side. Obviously they are trying to cultivate the Software Plus Services side, but that business is still very much in its early in its cycle. Linthicum: You can go off-premises with lots of stuff and the cost is always cheaper, and also it allows you to upgrade and innovate into new technological areas you haven’t driven before. Next, would be tactical, software-as-a-service (SaaS) applications. Take some of the HR processing, which is driven by some kind of in-house system in the data center, and outsource that to the dozen or so SaaS vendors who are offering HR processing. That's kind of a light-weight business process. Then, the next generation is even more risky, and I don’t see a ton of guys doing that initially. It involves some of the core business processes, and getting into an SOA kind of an initiative. Re-automating those, but also outsourcing a tremendous number that haven’t been done before for the primary reason of cost saving. Kobielus: I see definitely the economic downturn is going to expand the footprint, as it were, for the cloud in data warehousing, where data warehouses are becoming ever larger in the hundreds of terabytes and now into the petabyte. I’m seeing an upsurge in the number of start-ups and data warehousing vendors that now have cloud based offerings. ... In other words, where there is a capital expenditure crunch or a budget crunch, and users can’t afford to pay the millions of dollars to bring one of these petabyte-scale data warehouses in house, they are going to go outside to the likes of a 1010data or using Amazon EC2 to aggregate, persist these huge datasets. They can do very complex analyses and also run a greater degree of their data mining and predictive analytics algorithms in that very cloud. It just saves them money, and it's not a huge capital expenditure. It's a pay-as-you-go kind of thing. I think that's going to be the trend and those vendors who are already out there could be the major beneficiaries of this current economic crunch. Baer: ... In times like these, obviously you have changing economic conditions, changing in a very unpredictable manner. On the other hand, the financial crunch and the credit crunch is going to restrict the amount of resources you have at your disposal. So, you’re basically going to look very opportunistically. You are going to look at, let's say, the low-hanging fruit that will give you the greatest gain in savings or a way to respond to the market in a more agile manner. ... You won’t necessarily do a global top down or enterprise-architectural SOA transformation, if you haven't done SOA already. But, opportunistically, if you are trying to take advantage of some of these cloud-based services to start doing mining on a more massive scale, at the same time trying to lower your risk, it will require certain applications or data source that you may have. You may need to conduct a transformation, where you will implement, more flexible architectures, data SOA architecture. But you will do it opportunistically in these tactical areas, where you can take advantage of services in the cloud that give you the advantages of the transformation to solve the problem you need to deal with, and at the same time, minimizing your risk. Kobielus: ... The financial vertical and the government vertical are becoming overlapped. There is a degree of nationalization already that's taking place. The government is taking back Fannie Mae and Freddie Mac. I think they have taken over AIG, but all around the world, you hear governments, especially in Europe saying, “Hey, we need to re-nationalize or, to some degree, exert tighter control over the financial vertica., I think this is everywhere in the world. What we’re already seeing is that the government vertical, as they have indicated, will continue to grow, because it's going to exercise much greater oversight and equity positions within the financial vertical. I think the early part of this decade is a prelude to what we’re going to see in even greater abundance in the next 10 years. After the whole Enron fiasco, with Sarbanes-Oxley and so forth, we saw the growth of this market and this technology called governance, risk management, and compliance (GRC) to exert tighter control over the financials of private enterprise, and bring greater transparency. I think we are going to see now, the government exert ever tighter GRC reigns over the financial sector, to a degree unprecedented, because we now have government actually owning or controlling a number of the key firms in that space. So, the whole GRC sector is in an embryonic stage. There are a number of vendors like SAP and Oracle who have taken sort of a leading-edge position in that area. That will expand greatly, and we are going to see more of these risk dashboards and controls being implemented in the context of BI and the data warehousing investments that enterprises have already made. In terms of the horizontals, the GRC sector will come into its own, and it will be primarily the driver. There will be the financials, and then it will be around the world. All governments will enforce the use of this kind of technology. Baer: ... In the case of governance, I don't know if I would call it “opportunistic,” but it is an area in which you do not have an option as to whether you comply or not. Therefore, the only economic way to provide all the information and to do all the audits without having to rip apart all of your existing back-end infrastructure is through a service's layer on top of all that. Maybe I can come up with a cheap buzzword here, a buzz-line or a tag-line, such as “Son of SOX,” for what's going to become a changing regulatory environment. You’ll need a governance layer that can contend with changes in this moving target. Obviously, the only feasible way, from an architectural standpoint, to deal with that is do a flexible architecture, and that's essentially what a SOA is. Linthicum: I think this is a great time to do a startup. Number one, VCs be damned at this point. You don't need their money at all, just some angel investors to invest in some very minute infrastructure. With cloud computing out there and the number of things you can do from a marketing, application developer's, and outsourcing perspective, you can basically get a technology company up and running -- and profitable -- probably for the least real cost we've seen in years. It's a great time for people who are innovative, able, and resourceful to get out there and start technology companies. ... Now is a great time for small innovative new startups to get out there and help create new spaces, such as Web 2.0, and I think there are a number of SOA problems that needs solving as well. I'd love to see some startups get out there and take those problems on.